As you may have realised, I'm on a bit of a mission. The knitting time I've had in the last week has been all about learning 'brioche' stitch (so I can make a particular shawl I've fallen for). So far, I've managed to start two projects: one which is knit flat in one colour, and this one which is knit in the round using two colours. Learning this technique / stitch has not been as difficult as I expected. 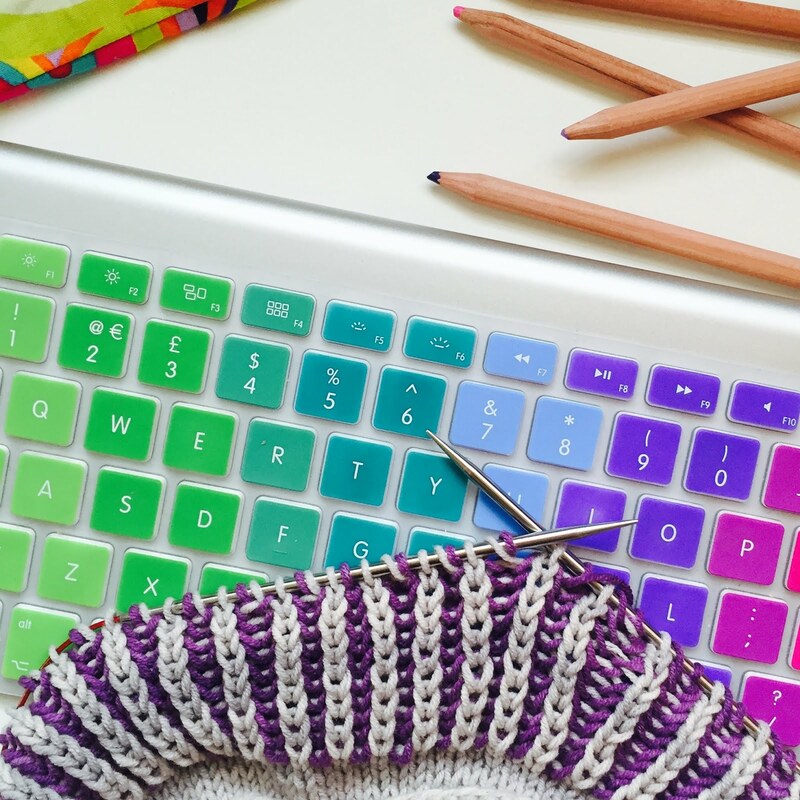 Knitting is like most other things in this respect, if you are willing to give it a try it can often turn out to be easier than you think. It only becomes frustrating when things go wrong. 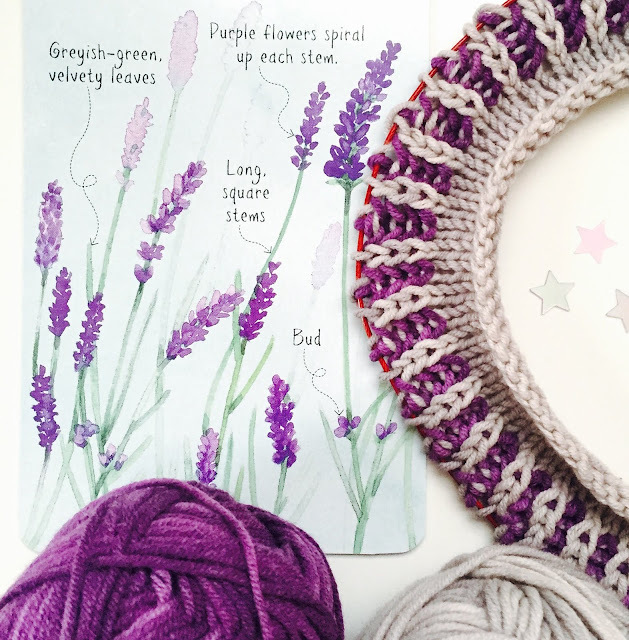 Earlier today I spent at least five minutes looking at my knitting (below) to figure out where the mistake was - no doubt you'll quickly spot that there's a missing 'yarn over' which should be paired with the fourth purple stitch along. It's obvious to me now, but at the time I couldn't see the wood for the trees. I knew that something was wrong - but not what it was or how to fix it. As in life, there are a few choices in this situation: ignore it and spoil the project, give up entirely, bodge it in some way, or figure it out and put it right. As I am determined to become competent in brioche knitting, the latter was really the only thing for it, so I put it down and had a few minutes break. When I came back to it, the error was clear and could be easily remedied. It was a very small mistake, but a useful one because I had to read and understand the row below to be able to pick up the correct yarn for a 'yo'. A little while later, when I noticed that I'd done a 'brioche purl' instead of a 'brioche knit' a few rows previously, I didn't hesitate to get my crochet hook out, drop the stitches down, correct the mistake and pick up the intervening rows again. It was easier because of fixing the earlier mistake. Familiar territory. I firmly believe that making and fixing mistakes makes us better knitters. 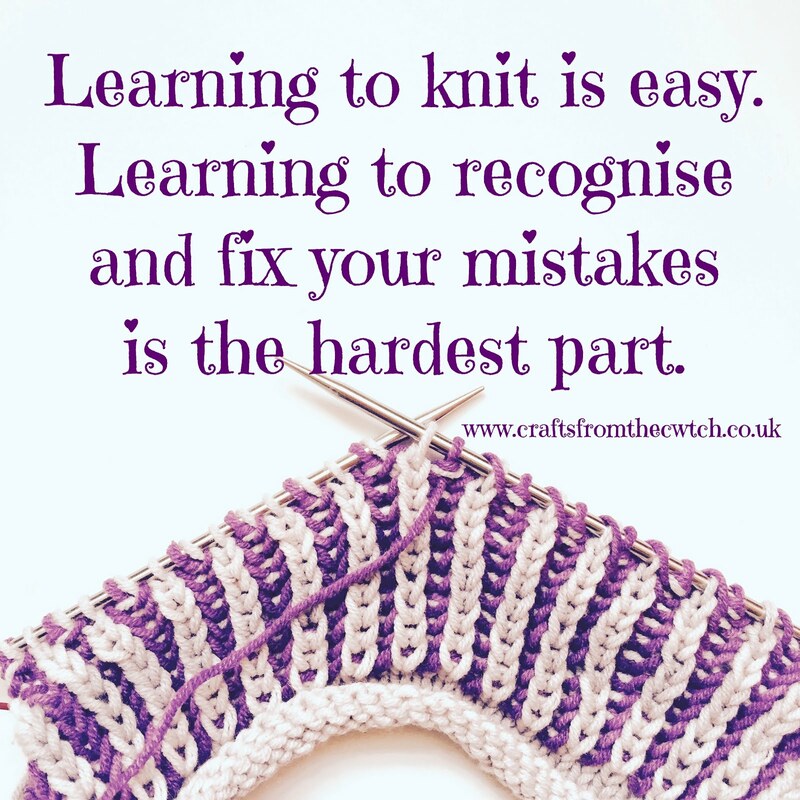 It doesn't stop at knitting - this also applies to most other things, although it's taken me four decades to embrace this idea. Mistakes give us the opportunity to develop our skills, and make us more competent - they are not something to be afraid of. I am certain that there will be plenty more mistakes to come but I'm planning to keep on practicing and figuring them out. How about you? Do you embrace your mistakes, or does the thought of doing something wrong terrify you? PROJECT DETAILS (Amazon affiliate links included) : I'm using Scheepjes Soft Fun Denim* yarn in shades 515 and 511 and my favourite Chiaogoo needles. Oh and the keyboard is a standard Apple Mac keyboard with a rainbow overlay - many people asked about that last week when I posted photos on Instagram. I try to fix the mistakes that I find, however I really struggle to understand how to fix dropped stitches to know how to fix those, so often bodge them to carry on or unpick to re-do the row. Ok Kerry, I'll see what I can do! I always make mistakes in my knitting & can't stand them. Sometimes I can correct them with a crochet hook but lace patterns often need to be taken back. I've never found lifelines particularly useful though. Have to get rid of the mistakes, I can't live with them.